Note: Typically this cake has three layers, but you cannot see them in this picture, primarily because I used a 9x9 pan instead of an 8x8 I think. They layers are there but the top and bottom ones are thinner than they normally would be, if it had been made in the correct pan. When I remake it I will post a new picture. Prepare an 8x8 baking pan with cooking spray or butter. Beat egg whites (at room temperature) in a metal bowl, with vinegar until stiff peaks form. Set aside. Sift flour, cocoa and salt together in a bowl, and set aside. Cream, together egg yolks and confectioner's sugar. Add in vanilla and mix in well. Add melted, cooled butter and mix well again. Add in dry ingredients, and blend until there are no lumps. Add milk. Mix well - it will be a thin batter. Gently fold in egg whites a portion at a time. Do not use a mixer for this. 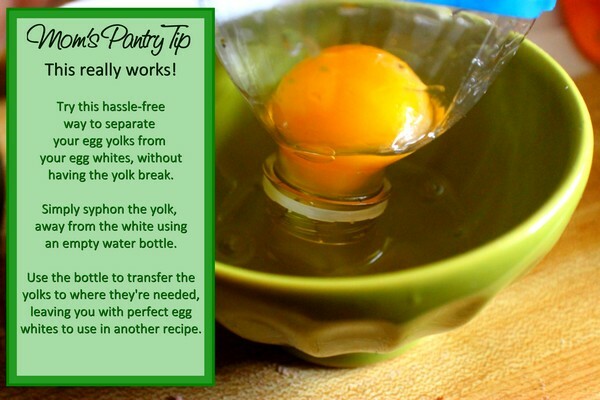 You need the egg whites to retain their volume. Pour batter into a prepared pan and bake for 50-60 minutes. Allow cake to cool completely before dusting top with cocoa. Check out the easy way I separate my eggs.